Surrounded by 13 polar bears! Some day I’ll see these magnificent creatures, as well as their brown bear relatives snatching salmon out of Alaskan rivers. This entry was written by whyevolutionistrue and posted on December 9, 2018 at 2:45 pm and filed under animal behavior, mammals. Bookmark the permalink. Follow any comments here with the RSS feed for this post. Both comments and trackbacks are currently closed. Yes, that’s a lot of bears. 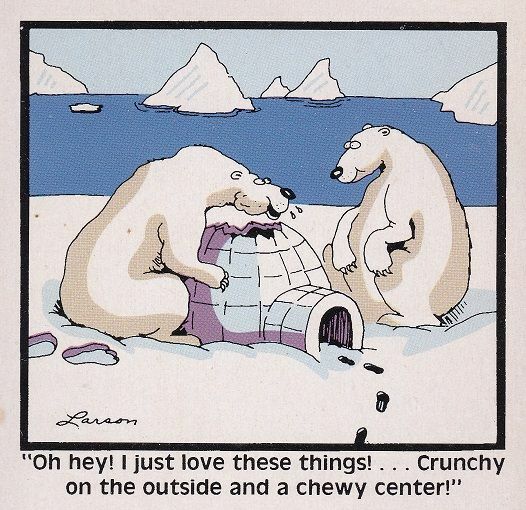 What was that cartoon with the two polar bears eating down through an Igloo. Crunching on the outside, soft in the middle. Sounds like Gary Larson alright. That is pretty ominous for a variety of reasons. Bears in general, polar bears in particular, are aggressively solitary beasts, so except for 1-to-1 mating encounters and cubs with their mothers (there is a family group in the picture), you just shouldn’t see them in groups. This probably speaks of a serious food crisis in the bear population. For a few days each year while waiting for the sea ice to strengthen enough to become maritimus, then accumulations along the land coast are long known. But for so many in one place, that is ominous. Amazing but yes, dangerous. These are a species that can consider humans to be food. I’m kinda tired of the whole “wildlife photographers filming wildlife photographers filming wildlife” things”. Granted, it’s not as annoying as those animal spy camera shows, where you have someone filming an animal-shaped camera filming the animals. This would however make a decent outtake dvd extra. ‘Fee fie fo fum, I smell the blood of an Englishman’…. they were lucky neither human nor bear got hurt. Incredibly dangerous set up. Is it unfair to say that by naming the bear they anthropomorphize it? You best hurry before the Mango Mussolini administration drives these animals into extinction.